Click on the links below for additional information on this revolutionary product!!! Also from Sensopart, the new F20 series offers a wide assortment of sensors in a compact body. Everything from through beam sensors to incredibly accurate laser sensors with background suppression! Click on the picture or the link for more information! Detecting colors? Even the most subtle variations in color are not a problem for the FT50C from Sensopart. With 3 channels and 5 tolerance levels for each channel, the user has tons of flexibility at an amazingly low price! Easy mounting and excellent performance are the key points of two new product families from Bircher Reglomat AG. 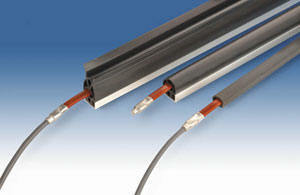 The new Click-Line rubber profiles allow for fast and easy mounting. Made with a special foot, they can be mounted by "clicking" them into a C-rail without the usual pulling-in from the side. This safes time - just simply click and done. 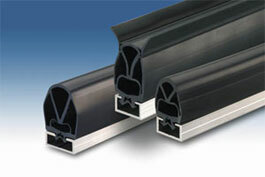 Based on the well proven switching strip ENT-20 Bircher Reglomat AG offers this very interesting solution. Similarly interesting are the features of the new miniature safety edge system S-Line. Easiest self assembling and small dimensions are the strength of this new product. Just a few steps are required to assemble a safety edge. With simple tools this can be done by installers or door manufacturers themselves. Suitable rubber profiles, switching units, end pieces, tools and other accessories make it a complete system. Introducing a new type of PLC. It's a unique panel mount all-in-one PLC. 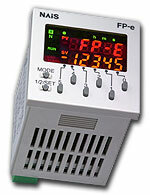 This FP-e is the same size as a standard digital timer but with all the functionalities of an advanced PLC. UL, CSA, UL, IP66. Great for small OEM machines. The FP-e PLC comes in the following three types. The FP-e is perfect for small desk top machines, lab use, test machines or distributed control on a production line where a small amount of I/O and a numerical display is required. What are the best kinds of applications for the FP-e? 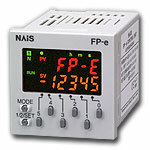 The FP-e has up to 144 built-in timers and counters that you can program. This is in addition to four high speed counters and 8 inputs that can be used in many ways. With this PLC, you can also scale your readings by using powerful math functions such as square root or square cube. Should your program become more complex and require expanded I/O, this can automatically be converted to an FP0 or FP Sigma PLC. For temperature control applications that also require controlling some I/O, the FP-e is a perfect solution. This PLC has two very accurate PID loops for temperature control (-30.0 to + 300.0 degree C). Just wire your thermocouple devices (K type), use Auto Tuning to control the temperature, and program your I/O control. This one package does it all. Temperature can be displayed and controlled either in Fahrenheit or Celsius with 0.1 degree resolution. Even though the FP-e is small, it produces superb PID results by utilizing our powerful floating point math and unique algorithm. The FP-e has built-in 2 axis pulse outputs with automatic acceleration and deceleration. Only the data below is required. This is how simple it is to setup a motion control. The FP-e also has step ladder which acts like a flow chart. This step ladder can make your program very simple. Another feature of the FP-e is that it can be used as a pulse generator where the frequency can manually be changed while monitoring the digital display. Mead Fluid Dynamics has released an innovative new valve that will change the market place. Through its patented "half-shell" design, Mead's MOD3 series minimizes size and turbulence resulting in much better flow over its competitors! outputs to minimize air consumption during normal operations. PLC programming is not required for Air Economizing Functions because this function is included in the electrical enclosure. Optional DeviceNet communications are available. There are 4 separate states of air logic: vacuum, blow-off, idle, and EOS. The air circuit illustrates a basic normally closed unit with the Emergency Stop operating system. 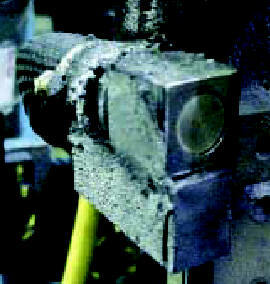 Vacuum is created when a high signal is sent to Vacuum Pilot Valve (1). The output of the vacuum Sensor (2), controls the vacuum level and air economizing function by feedback to the Vacuum Solenoid Valve (1). The Check Valve (3) maintains the vacuum level until the Blow-off Pilot Valve (4) is activated to release or the hysteresis value of Sensor (2) is reached to restore the original vacuum level. The Emergency Stop operating system (5) is activated by an emergency stop or power failure. Mini Cylinders can meet your requirements for clamping, gripping, stopping, pressing, etc., in applications where space is a premium. Mini cylinders have a hose barb fitting installed in the rod end of the cylinder, standard female rod thread and two through holes for ease of mounting, no brackets required. VA01 Series valve is used in centralized vacuum systems. Available for: vacuum control, blow-off control, or one valve for both. 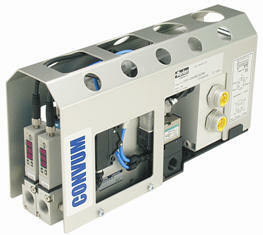 10mm wide solenoid valve is lightweight, compact, and direct acting. FSV Series valve assists in maintaining an acceptable vacuum level in the vacuum system if vacuum cup does not make a proper seal. This can be critical to the performance of the vacuum systems that have a single source vacuum generator with multiple cups. Direct mounting to cups using M5 to G3/8 connection. CH Series valve is used to hold a degree of vacuum when the vacuum generator is turned off. This poppet design valve has low leakage rate and cracking pressure of 2.9 PSIG. 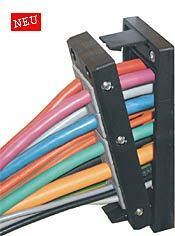 Icotek-KEL-Systems can be quickly mounted to ist base without tools. The KEL-SNAP-SYSTEM is available in two sizes 16 and 24 (Harting) Cut-out.